The Gridlines addin has the function of adding balloons (as sketched symbols) at the end of each gridline, thus automating the annotating. A gridline is a workplane projected in a drawing view. 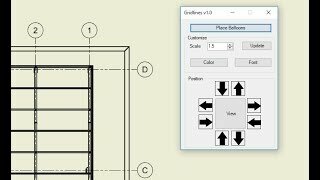 Therefore, the user must have the workplanes created, that will represent the gridlines, and projected in the drawing sheet. Additional options are: balloon scaling, color, font, balloon positioning. This trial version will allow you to use the full version 20 times.